Rain has so far dogged the second edition of the Indian Premier League. For a second consecutive time, King’s XI Punjab were sadly at the receiving end, but perhaps not as cruelly as against Delhi Daredevils, since recognition must be accorded to the power play of West Indian captain Chris Gayle, who vitally swung the game Kolkata Knight Riders’ way with an unconquered 44 off 26 balls. Heaving a sigh of relief after his team tasted the first win in the second Indian Premier League, Kolkata Knight Riders captain Brendon McCullum today said no ground is big enough for Chris Gayle when gets going. Rajasthan Royals and Mumbai Indians split points after their Indian Premier League match was called off due to persistent rain at Kingsmead ground here today. Not even a single ball could be played due to steady drizzle. Kolkata Knight Riders (KKR) owner Shah Rukh Khan today revealed he has been receiving "strange" hate mails for stripping Sourav Ganguly of KKR captaincy. "I get strange hate mails from people for taking decision for the team's sake," Shah Rukh said after KKR tasted their first win of second IPL against Kings XI Punjab today. 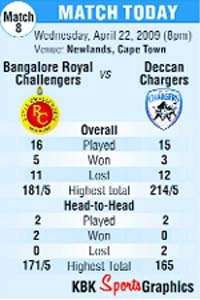 Shrugging off the hangover of second-match defeat will be high on the agenda of Royal Challengers Bangalore, while Deccan Chargers would strive to keep their redemption journey on when the two teams lock horns in their Indian Premier League match here tomorrow. Pakistan captain Younis Khan is banking on his fast bowlers Shoaib Akhtar and Umar Gul to provide the firepower to match the pace of the Australians in the one-day series in Dubai and Abu Dhabi starting tomorrow. Tennis Australia today filed an appeal against International Tennis Federation's decision to approve Chennai as the venue for next month's India-Australia Davis Cup tie. ITF will hear into the appeal this week and decide on Tennis Australia's request to shift the tie out of India on security grounds. Dempo conceded a last-minute goal against Al Muharraq of Bahrain in an AFC Cup Group E match to miss out a chance to set one foot onto the last 16 stage of the at Nehru Stadium here today. Rain has so far dogged the second edition of the Indian Premier League. For a second consecutive time, King’s XI Punjab were sadly at the receiving end, but perhaps not as cruelly as against Delhi Daredevils, since recognition must be accorded to the power play of West Indian captain Chris Gayle, who vitally swung the game Kolkata Knight Riders’ way with an unconquered 44 off 26 balls. KKR won by 11 runs on the Duckworth-Lewis method, having posted 79 for one in 9.2 overs. After Karan Goel denied Yusuf Abdullah a wicket by dropping a sitter at square leg, Gayle simply stood and delivered, as he’s wont to when in the groove. With economical footwork, he traded substantially in sixes - four to be precise. After a bit of circumspection to gauge the conditions - and Irfan Pathan was swinging the new ball - he sent him sailing over point and later golf-like over long on. Abdullah, a left-arm medium pacer from this city’s 800,000 odd Indian origin community, and Vikram Malik saw short deliveries disappear over midwicket. The limitations of KXIP’s attack in the absence of Brett Lee and Sreesanth were somewhat exposed. Brendon McCullum, captaining Knight Riders for the second time, joined the party. He flat batted Abdullah over extra cover and followed this with an upper cut off Malik - both over the fence. He and Gayle realised 57 for the first wicket in only 5.3 overs before he was smartly caught behind. Kingsmead generates thrill and trepidation. Batsmen are excited about its short boundaries - one only 53 yards away on Tuesday; at the same time fearful about its bouncy pitch. Of course, for good horizontal stroke-makers, it stands up quite nicely. While it’s still early days in the tournament and a turnaround is possible at any time up to the first half of second round league matches between the eight teams, this was a tense affair for both squads because one of them would end up without any points after two games. Ishant Sharma, bowling a lively spell, dismissed Goel early. But it was not until Saurav Ganguly - with his curling medium pacers - struck twice in the same over that Knight Riders felt comfortable. The former Indian captain’s figures of two for 24 were the tidiest of his franchise. Pathan, after 32 off 17 balls - which included a six hit across the line at the expense of Sharma - departed to an excellent catch by Murali Kartik on the boundary line, before Ravi Bopara, a Briton of Indian origin, edged a cut to McCullum standing up. But Yuvraj Singh, in his calm, clouting style steadied the ship. At the “time out”, KXIP were 67 for three; and matters were in the balance. But the enforced strategy breaks have, so far, proved undesirable to batting sides. The last thing a batsman needs is a stoppage to spoil his concentration. Yuvraj, nevertheless, top scored with 38 from 28 balls, blasting two sixes to midwicket and long on off Ganguly and Laxmi Ratan Shukla respectively, before holing out off Moises Henriques, an Australian of Portuguese origin. Unfortunately, for KXIP, the skilful Kumar Sangakkara had been run out before this, which nipped a promising partnership of 56. Mahela Jayawardene assumed responsibility, though, and ensured the Chandigarh unit reached a competitive total 158 for six in their 20 overs. A six clipped to midwicket off Ashok Dinda was proof of his undoubted pedigree. He remained unbeaten on 31 off 19 balls. Conditions were tricky in the second half of the KXIP innings. A shower during the “time out” freshened a greenish pitch. This, admittedly, rendered the ball wet and slippery - which was probably why Kartik didn’t get a bowl - but it also made it skid when the seamers were in operation. Fall of wickets: 1-9 2-47 3-48 4-104 5-122 6-131. Bowling: Ishant 4-0-24-1; Dinda 4-0-34-1; Henriques 4-0-32-1; Ganguly 4-0-24-2; Shukla 2-0-22-0; Gayle 1-0-14-0; Kartik 1-0-7-0. Bowling: Irfan Pathan 3-0-27-0, Yusuf Abdulla 2-0-20-0, Vikramjeet Malik 2-0-23-1, Piyush Chawla 2-0-8-0, Ravi Bopara 0.2-0-1-0. After the defeat against the Hyderabad Deccan Chargers in their tournament opener, the Knight Riders took today's match against Kings XI Punjab as an opportunity to shrug off the setback and bounce back. The rain-interruption did help them but McCullum felt with Gayle in such ominous form, it would have been difficult to stop the rampaging left-hander. "It was a nice result after the first match defeat and we bounced back at the right time to gain some momentum," McCullum said after Knight Riders won the rain-marred match by 11 runs via Duckworth-Lewis method with Gayle remaining unbeaten on 44 from 26 balls. "Chris played really magnificent upfront. It was tough batting on out there for everyone except Chris. And when he hits the ball so well as he did today, no ground is big enough for him," McCullum said of the talismanic West Indian. McCullum's opposite number Yuvraj Singh, meanwhile, was sombre after Kings XI Punjab found themselves at the wrong side of yet another rain-curtailed match and admitted the bowling department lacked both firepower and sting. "It was bit unfortunate again," said the left-hander. "We dropped a couple of catches, then came rain and Duckworth-Lewis method. It was just not our day," he rued. Rajasthan Royals and Mumbai Indians split points after their Indian Premier League match was called off due to persistent rain at Kingsmead ground here today. Not even a single ball could be played due to steady drizzle. The Mumbai team, after gaining one point from today's washed out tie, have moved to the top of the table with three points in their kitty. The Sachin Tendulkar-led side had defeated last year's runners-up Chennai Super Kings in their opening match on Saturday. Port Elizabeth: Bangalore Royal Challengers skipper Kevin Pietersen has been warned by the Indian Premier League for showing dissent over an umpiring decision during his side's humiliating 92-run loss at the hands of Chennai Super Kings. Pietersen received an official warning from the IPL for objecting his first-ball lbw dismissal off the bowling of spin wizard Muttiah Muralitharan last night. Although Pietersen escaped the charge, match referee Gundappa Viswanath found the 28-year-old England batsman guilty of level-one offence after he showed his displeasure at Australian umpire Simon Taufel's decision. Kolkata Knight Riders (KKR) owner Shah Rukh Khan today revealed he has been receiving "strange" hate mails for stripping Sourav Ganguly of KKR captaincy. "I get strange hate mails from people for taking decision for the team's sake," Shah Rukh said after KKR tasted their first win of second IPL against Kings XI Punjab today. "But that is okay, I'm saving them all so that I can go to each house and say (the KKR anthem) 'Korbo, Lorbo, Jeetbo' (I'll do it, fight and win)...," he added. In a fervent plea to the Kolkatans to stay by the side of KKR, Shah Rukh said, "Along the way if we go wrong, please feel for us and send us positive energies." Arguably the most hyped Indian Premier League franchisee, KKR has been in the news this year since coach John Buchanan floated the multiple-captain theory which many in Kolkata saw as yet another Australian ploy to strip local favourite Sourav Ganguly of captaincy. Buchanan's idea was eventually shelved but Ganguly didn't retain his job either as KKR named Kiwi stumper Brendon McCullum as its new captain, a decision that did not go down well in Kolkata. Shah Rukh said it was not easy pleasing people in Kolkata where emotions run high and admitted there was tremendous pressure on his side. "We are under a lot of pressure. We are a hyped team because the owners are from film industry and because we have the most passionate city backing us," the Bollywood actor said. "For good and bad, the Kolkatans love us one night and one night they do get angry with our decisions. But I promise you guys that the dream I have is to come to Kolkata with the IPL trophy and dance. Will do some new steps for Korbo, Lorbo, Jeetbo," he said. Incidentally, Sourav Ganguly played a cameo role in today's win with two quick wickets even though he didn't get a chance to bat. Shah Rukh took the occasion to pledge his support for Ganguly and said for him, the former India captain remained the greatest KKR player. "I want him to be the Player of the Tournament this year. Whoever feels he is not given importance in the team, let me tell you that for me, he is the greatest Knight Riders player. The Bangalore team started their journey in the second edition of the Twenty20 tournament in style by drubbing the defending champion Rajasthan Royals by 75 runs, but could not show that consistency in their second encounter which they lost to Chennai Super Kings by 92 runs yesterday. Skipper Kevin Pietersen will certainly expect another gutsy knock from Rahul Dravid, whose 48-ball 66 laid the cornerstone of their win in the first match, while there might be some experiments with the opening slot depending on the conditions on the match day. But a good foundation by the opening pair is going to be crucial to post a good score or chase down a stiff target, specially under artificial lightings, set before them. Pietersen himself will be there adding to the strength of the middle order batting, while he will also expect the star Protea all rounder Jaques Kallis to encash on home advantage. "We have quality bowlers in Shoaib Akhtar and Umar Gul and if they provide the start we want we have back up bowling to match the Australians," Younis said today from Dubai. He said the series was important for his side as a winning result would boost Pakistan cricket, which is needed at a time when international teams are avoiding playing in the country due to security concerns. "No matter what team the Australians bring they are the world champions and they like to win all the time. Beating them would always be a big plus for us," he added. Younis said since the pitch at the Dubai Sports City is being used for the first time any team winning the toss would prefer to bat first. "The lights are such at the stadium that I don't think any team would like to chase a total. But it all boils down to which teams gets right in batting, bowling and fielding." He also said the ICC's decision to shift the 2011 World Cup matches from Pakistan had shocked him and his teammates. Tennis Australia today filed an appeal against International Tennis Federation's decision to approve Chennai as the venue for next month's India-Australia Davis Cup tie. ITF will hear into the appeal this week and decide on Tennis Australia's request to shift the tie out of India on security grounds. ITF had cleared Chennai as the host city despite TA's concerns about coming to India. "The All India Tennis Association has been advised today by the ITF that Tennis Australia has officially appealed against the decision of the Davis Cup Committee to the ITF Board regarding confirmation of the Davis Cup venue as Chennai. "ITF has confirmed that the appeal will be heard as soon as possible, definitely within this week," an All India Tennis Association said in a press release. Substitute Madhkoor headed home a well directed cross by Leandson in the 90th minute to give Al Muharraq their first win and hand the hosts their first defeat. Dempo, who took field without two key players - striker Ranty Martins and midfielder Roberto D' Silva - due to double bookings, still topped the group on seven points from four matches. They had won twice and drawn once in their earlier three group round robin matches. Al Muharraq, who drew all their earlier three matches to have six points from four matches, are placed second. Both the teams started cautiously which saw play confined to midfield in the initial stages with Dempo having an early chance to forge ahead but their strikers lacked the sting in the absence of Martins and D'Silva.